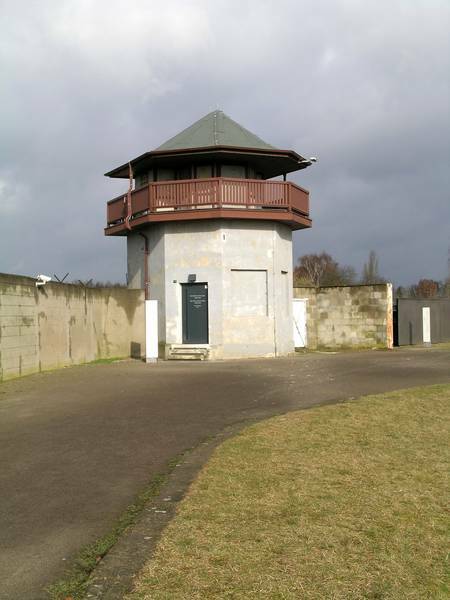 The exhibition is located in the former Watchtower E on the northern tip of the camp’s triangle-formed site. It deals with the question about what the Oranienburg population knew about the concentration camp in their city and how they behaved towards the prisoners and the SS. Stories about bystanders and those who were indifferent, co-perpetrators and profiteers, but also about people who helped the prisoners and who resisted National Socialism are presented here. The visitor is led along a stairwell where eight audio and visual stations are set up. They deal with, for example, the “SS neighbour”, the prisoners’ paths within the city, the self-portrayal of the SS, forced labour, the death of the prisoners as well as the resistance by the Confessional Church Parish. The view from the stairwell of the various reference points in the surrounding area makes the issue regarding the borders between camp and city and their partial crossing-over clear. The architect Dr. Günter Hipfel was responsible for the building’s renovation and the exhibition’s design was created by Gerrit Grigoleit. The exhibition is mainly based on interviews with Oranienburg witnesses from the time. In addition, photos, prisoners’ drawings and diagrams as well as animations in short film sequences are shown. There are two glass display cases which present objects made by the prisoners that were given to individual residents of Oranienburg to thank them for their help. The exhibition reports on the pogrom-like situation in the streets of Oranienburg when the Jewish prisoners arrived in 1939 and on the presence of concentration camp prisoners in the city. It also talks about the smoke coming out of the crematorium which sometimes hung over parts of the city. The Oranienburg registrars who certified the almost 10,000 cases of death in the camp up until October 1942 are portrayed. Afterwards, the SS began to maintain their own registrar in order to keep the rising number of deaths secret. In Oranienburg, resident armament manufacturers such as Auer or Heinkel belonged to the profiteers of the prisoners’ forced labour, just as did the small and mid-sized companies and the city itself, for which prisoners laid piping and streets commissioned by the city. One especially remarkable element of the exhibition is the narrations of Kurt Scharf, a Protestant priest of the Sachsenhausen parish and later the bishop of Berlin-Brandenburg. He courageously opposed the SS, thus putting himself in danger of being taken to the concentration camp. Very soon after the foundation of the Sachsenhausen Concentration Camp, he attempted to provide pastoral mentoring for the concentration camp prisoners, something which was brusquely rejected by the camp commandant, Karl Koch. Later however, Kurt Scharf was successful at visiting the Berlin priest Martin Niemöller in the camp. Niemöller had been sent to the Sachsenhausen Concentration Camp cell block as “Hitler’s personal prisoner” on March 2, 1938 since he was the leading member of the Confessional Church. After Niemöller was imprisoned, the Confessional Church Parish in Sachsenhausen began to pray regularly and to ring the bells for the concentration camp’s prisoners. In the concentration camp, the song “Dorfglocken” (“Village Bells”), based on a Russian folk song, was among the favourite camp songs. The third stanza was supposedly written as an addition by a German communist prisoner in reaction to the bell-ringing. The song can be heard as part of the exhibition. The exhibition “The City and the Camp” in Tower E avoids any easy answers to the questions it asks. However, it does show numerous examples of what people saw and heard and how they acted in concrete terms, in other words, if they looked away, participated in crimes or if they used the opportunities for action which existed within the NS system. One of the questions which today’s visitors are forced to ask themselves is: What would I myself have done back then?